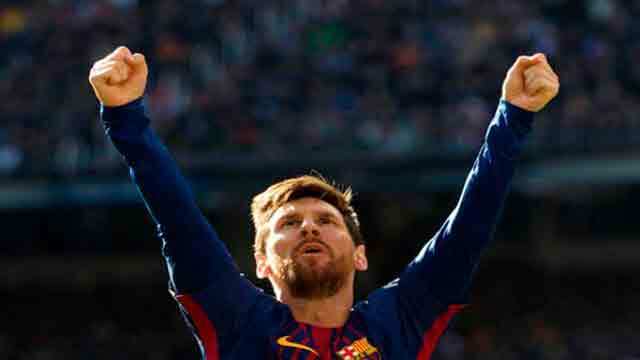 Dhaka, Dec 23 (Just News): Barcelona took a huge step towards regaining the La Liga title as goals from Luis Suarez, Lionel Messi and Aleix Vidal beat bitter rivals Real Madrid 3-0 at the Santiago Bernabeu on Saturday to open up a 14-point lead over the European champions. It could have been very different for the hosts if Cristino Ronaldo had buried a huge opportunity when he completely miskicked just 10 minutes in. Barca didn’t threaten at all until the half hour mark when Messi finally found some room in a congested midfield to pick out Paulinho’s late run and the Brazilian’s acrobatic effort was matched by a flying save from Keylor Navas. Seconds later it was Marc-Andre ter Stegen to demonstrate why he has been one of the keys to Barca’s success this season by getting an outstretched toe to turn Ronaldo’s fiercely struck shot behind. Benzema was inches away from giving Real a half-time lead as he headed against the post two minutes before the break. However, Barca came out a different side in the second period to almost certainly put the title out of Madrid’s reach. Nine minutes after the break Sergio Busquets’s calm opened up the Madrid midfield as he fed Ivan Rakitic and Sergi Roberto eventually crossed to Suarez to apply the finishing touch. Suarez was spared the embarrassment of missing two huge chances in an incredible goal mouth scramble that led to Barca’s second. Navas saved Suarez’s first effort before he fired against the post with the goal at his mercy, but Paulinho’s follow-up was punched off the line by Dani Carvajal. The Spanish international accepted his punishment of a red card and Messi dispatched the resulting penalty into the top corner to kill the game as a contest. Ter Stegen produced more heroics to ensure there was no Real fightback as he again denied Ronaldo.